Junk food with a difference! Spent yesterday, a pleasant Sunday morning, at the workshop organized by the Times of India on ‘Healthy cooking for Kids’. My mind was clear – that I was going to demonstrate some foods that kids will enjoy and mothers will have no qualms in making them or serving them, because even though they ‘looked’ like kids’ favourite junk food, my version had added ingredients that made the dishes healthy food! So, the goal was to create awareness that it is possible to keep both kids and parents happy about food, the taste, and the health benefits. I say, if kids want junk food, give it to them, but only after tweaking the recipes adding some healthy elements. First of all, it was heartening to see some children sitting right ahead near the stage! The seats were full with adults, but the children who came to see the show got the best view! Kids are fond of food and eating, and not to forget these days they are doing it the smart way! They are quite aware of what and how much they should be eating. At home also, amongst both my kids, while the elder one – Rachita is a foodie, the younger one – Kriti always has a question mark on her face as to why should we eat and being an athlete, she likes to keep a tight rein on the consumption of fatty food at home. She is the one who is constantly keeping tabs on my weight and asks me to slim down the moment she feels I need to! A good thing, for this generation needs to be alert about diet and fitness like none other. My time, albeit one short hour, went fast in showing dishes like NRG Shake, Healthy Pizza, Sprout Bhelpuri, etc. These recipes are visible on http://www.sanjeevkapoor.com. I could interact with the attendees and answered their queries. Soon Madhuri Dixit joined us and she regaled the audience with her tips on how she handles her boys, who are finicky eaters, and how she is focused on bringing nutritious food onto her table. I have always thought of breakfast as an important meal and have written numerous columns advocating the cause of starting your day with a power packed meal because eating breakfast contributes to weight control. Our supply ofbreakfast recipes has been consistently appreciated. Breakfast skippers may eat more food than usual at the next meal and may also tend to eat foods higher in fat and calories. Skipping breakfast may also result in late morning hunger and food cravings and leave you susceptible to munching on higher fat, low nutrient choices such as biscuits or cups of tea or coffee at mid morning and then less healthy food choices at lunch. If you can make menus using breakfast recipes, you will find it easier to get along. Those who eat breakfast are more likely to avoid energy lows and extremes in hunger (which are partly responsible for cravings for sugary foods). Eating breakfast also boosts your metabolism so you burn calories more efficiently throughout the day. If you go for very long periods of time without food and then have a large meal, you encourage your body to store many of the calories in your fat cells, instead of in muscle cells. If you are not hungry in the morning, try eating a little less the night before. Gradually, after eating breakfast for a while, you may be able to ‘train’ yourself to feel morning hunger (turning the hunger mechanism from the brain to the stomach!). If you just do not like to eat breakfast, or believe you do not feel good when you eat breakfast, you can break breakfast up into two smaller meals, but do not skip breakfast altogether. Eat a hard boiled egg at home, and an hour or two later, take a break from work and snack on an apple and a handful of healthy nuts like walnuts. For exciting breakfast recipes that are handy to pack and carry are Cheese and Pineapple Sandwich, or roll up a few Dal Chawal Parantha. Better still drink up a fruity strawberry soya and orange Shake at home! FoodFood, my 24 X 7, TV channel, turned one yesterday, January 23! It has been a year of growing with leaps and bounds, with many new experiences. As we enter the second year, there is a renewed energy running through the entire organization. We hope to establish ourselves better, firmer, cooking great food with introduction of new programmes. Come Sunday January 29, a treat awaits! 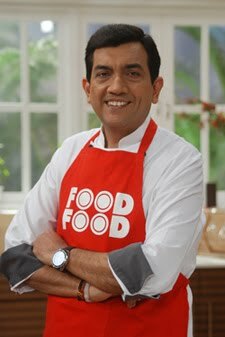 I have a workshop on cooking healthy food for kids at Novotel Mumbai Juhu Beach starting at 11.30 am. This is being organized by The Times of India as part of their ongoing Mumbai for Kids campaign. So what’s cooking there? You can see in person. Simply register using an SMS. The executives will call you back with a confirmation. It is on first-come-first-served basis. I believe the seats are limited, so why wait! As January 26 will be a holiday, it will give us a chance to cook up some tricoloured foods that will delight the whole family. Giving you some recipe suggestions here. Innovation with an International touch! Beginning this new week with fun, excitement and lots of cooking what with the Innovation Station (Season 3) Competition in the office! The theme was “International Cuisine” this time where three chef teams compiled some interesting dishes. We had very busy kitchens, with steaming pots and pan, a real battle of the biggies, and one could feel the palpable heat of competition and creation! As expected, they came out with super amazing recipes on their platters where each one of them cooked a three course menu, consisting of a starter, maincourse and dessert. Team 1 – Anupa Das with Aesha Majithia – presented Basil & Watermelon Shooter, Deconstructed Chicken Sandwich,Fishato with Plum & Pista Vinaigrette Greens and Aqua Bomb. Team 2 – Saurabh Mishra with Sheetal Kadam – presented Assorted Sushi, Steamed Basa Vegetables with Orange & Black Bean Sauce, accompanied with Coconut Steamed Bread and Jasmine Tea Mousse with Fresh Passion Fruit. Team 3 – Anirudh Shrivastava with Dilpreet Singh Kohli – presented Roasted Candied Garlic Soup with Yam & PrawnRoulade & Mango Pico Di-gallo, Mushroom & Yogurt-Pomegranate Oblong Bruschettas, Stuffed Lamb with Cous Cous, Red Rice, Orange Gremollata, Guacamole, Jus Reduction & Rolled Mascarpone Ricotta Cheese and ended withIsodelphia. I am sure you will be keen to read the recipes so will be uploading them in a couple of days. Winners are Team 1 – Anupa Das with Aesha Majithia. Congratulations to the duo! More excitement!! 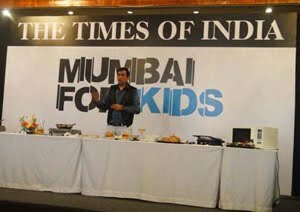 Coming Sunday, January 29th, Times of India, under their TOIKIDS campaign, are organising a cooking workshop at Novotel Hotel, Juhu, Mumbai. I will be there making healthy recipes for children that will look and taste like junk food. For entry, SMS TOIKIDSNAME to 58888. Rush, it is going to get crowded there! This week, try some snacks that are excellent when kids come home hungry after playtime. 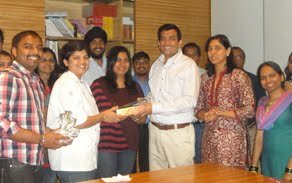 The Hindi version of www.sanjeevkapoor.com was officially launched at Sura Vie lounge bar in Delhi last evening at a press conference. Yes, it has been on display for a few weeks now but we did have a small official announcement to declare it as visible. I had always felt that the potential for the local language is untapped in the digital content space. 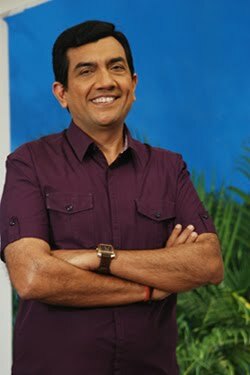 With www.sanjeevkapoor.com now in Hindi, we intend to bridge the divide between our Hindi and English audience. 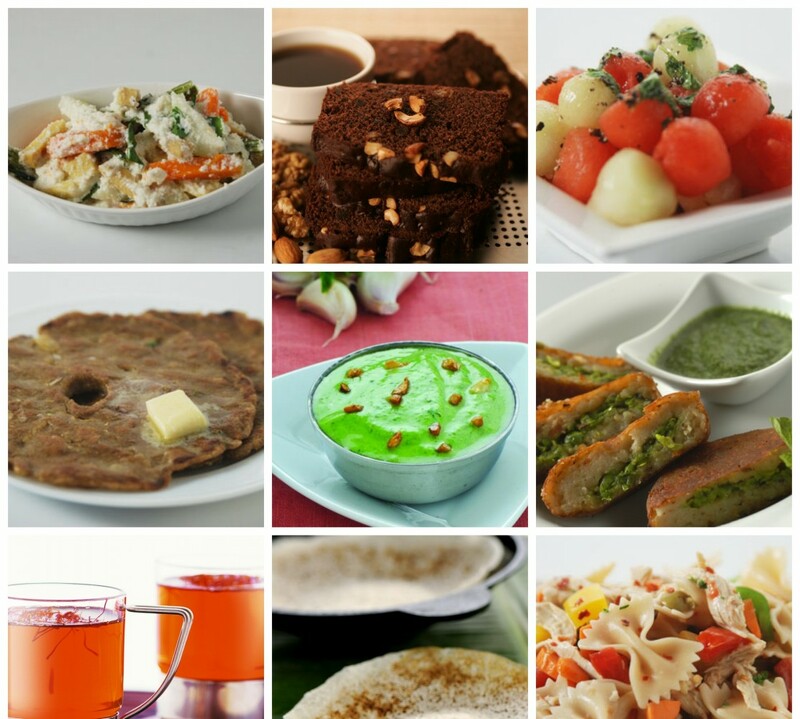 Users from every part of the world have been demanding recipes in Hindi. This is an opportunity for Hindi speaking people to post their recipes as well as get information on varied cuisines. I believe the market is slowly and gradually responding to the emerging demand, and we are about to witness an explosion in local language content soon. Sura Vie was also a centre of attention this week as the famed band Indian Ocean had their live performance there yesterday, i.e., January 19, 2012. to add to this, personally, I love their songs as well. Every year we have a small tradition that we follow. A little gesture, but it is these small things that matter, isn’t it? Since past twelve years my team has been having a baking day at a nursery school in Juhu. And they did have a baking session there today. Tiny tots, they are such a delight, love the fact that they get to mix batters, make a mess, lick the bowls, then watch them bake and be served with fresh fragrant cakes in school! The teachers do enjoy this special treat and love to judge which of the small kids has an inclination toward food and cooking! Start them young, eh? Giving some pics to reveal what fun this activity is. Monday will also see the next of the Innovation competition within my team of chefs. Topic is International cuisine. And a high difficulty quotient is expected for sure! Will post the recipes after wards. As it is nice and cool still I think a few thick soups and stews will come in good stead. Enjoy your weekend! Breakfast recipes are always welcome, aren’t they? So here we are again, talking about the most important meal of the day, breakfast! Those of you who drive a car know that it needs to have fuel to run. In the same way, all of us need breakfast in the morning, which will keep us revving through the day. Yes, refueling is there at lunch and teatime and dinner, but the kick-start has to be breakfast! Pages can be filled up with health facts about breakfast and breakfast recipes. People do not have this important meal because they do not have time in the morning. Whatever may be the time you have to leave for work, college, school there IS time to eat breakfast. You need to be organized as well as committed to the fact that breakfast has to be taken seriously. In the long run, eating breakfast helps to maintain better health. Organise a menu. Make a list of things that your family would enjoy for breakfast. Then shop for them, at least the non-perishables and be equipped. The following play some role at breakfasts: cereals, cheese, sweet corn, poha, rawa, dalia, nuts, whole-wheat flour. Look for a bakery that can give you fresh whole-wheat bread. There are certain brands that claim to be whole-wheat but is actually refined flour bread given the golden brown colour with caramel. For healthier versions of breakfast, make some switchovers: from butter to hung yogurt, from mayonnaise to absolutely no mayonnaise except once in a blue moon, from whole eggs to white of eggs, from paranthas laden with ghee to paranthas brushed just a bit with ghee, from full cream milk to skimmed milk; if you can, avoid tea and coffee. Yes, this is a difficult thing to achieve but like we say, if you can! Tea and coffee in moderation cannot be harmful but if one is used to having them in a stream while at work, acidity can become a major problem. And, also cutting down on tea and coffee has one advantage, you can also cut down on your total sugar intake! Some tips for easy breakfast. • Make sandwiches. Buy the bread the night before. Apply green chutney, some slices of tomato and lettuce, or pineapple or boiled egg whites. Install them as high as you can bite, wrap in foil and eat if you cannot avoid it, on the move. • Idlis make a good breakfast but how can it be a jiffy one? It can be, provided the batter is ready to be used. It takes ten minutes to steam a batchful. Sprinkle some sprouts and chopped green chillies and have them while still warm. • Have fresh seasonal fruits with whisked yogurt. It makes a wonderful healthy start to the day. For more of such ideas for Breakfast recipes, look at Brown Bread Upma, Tropical Fruit and nut smoothie Hot and Sour Idlis. Mumbai success day – runners unite! It was a lovely and fulfilling experience to see Mumbai’s solidarity at the Mumbai Marathon organized at Azad Maidan yesterday. My 7th Dream Run for the Forum of Autism and it is heartening to see that the cause is attracting more and more people with every passing year. This year, as always, Alyona and our daughters were with me and also Chitra, President of Forum of Autism. 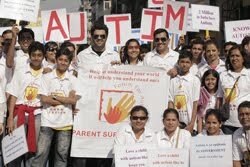 Harsha Bhogle was represented by his wife Anita and TV actor Manish Paul, showed his support by running with us. Even Alyona’s sister Jyotsna ran. My office team came in a large number. So, as we continue to support the cause of autism the numbers who are joining us are also increasing. Last few days have been hectic and full of travel what with the opening of The Yellow Chilli in Bahrain and then in Nepal (Kathmandu). Two entirely different nations and cultures but because of their great expression of love for Indian food, they are bound together on the same string. Tomorrow, doing a live demonstration at the Maharashtra Senior Police Officers’ Mess where the wives of police officials are getting together for their annual event. I will be demonstrating some mocktails, starters and desserts. Toward the end of the week, on Friday, going to Delhi to enjoy the evening with the band Indian Ocean performing at our lounge bar Sura Vie at Connaught Place. As Makar Sankrant and Lohri mark the beginning of the warmer weather from now, let us make the most of the winter vegetables still available in their resplendent colours…here are some suggestions of main course that are perfect with rotis.